Back to Greater Expectations: The New Geopolitics of Climate Change index page. The nighttime skyline of Singapore, one of the world's wealthiest countries and one of the most vulnerable to climate change. Photo by Coco Liu. SINGAPORE -- This is a rich island nation, and despite pressures to help combat climate change, it fully intends to stay that way. Standing on the peak of Jurong Hill, looking out across a man-made isle off the mainland bearing the same name, it’s easy to see why. Manufacturing facilities crowd the artificial land mass. Silver-colored storage tanks and giant chimneys painted in red and white indicate its status as one of the top three oil refining centers in the world. Home to oil giants like BP PLC, Royal Dutch Shell PLC and Exxon Mobil Corp., Jurong Island's refineries contribute heavily to Singapore's greenhouse gas emissions profile. But they also make this tiny nation one of the richest per capita in the world, and its leaders have signaled no plans to restrict the country's economic engine. "The energy and chemicals industry is a major carbon emitter worldwide. It is the nature of the industry," Singapore Prime Minister Lee Hsien Loong explained in a speech at the opening of Exxon Mobil's new facility last year. "We must reduce our emissions, both of greenhouse gases as well as other more local pollutants," Lee said. "But at the same time, I want to assure all the energy and petrochemicals companies here that the Singapore government stands fully behind them and will continue to help them to succeed." Under the United Nations' 20-year-old climate change agreement, Singapore is considered a developing country exempt from the emissions cuts that are mandatory for a handful of industrialized nations. But as governments prepare to sign a new accord in Paris in December, those old divisions are fading away. Countries like Singapore -- where the economy has more than tripled and whose emissions have jumped by 61 percent since the dividing lines between "rich" and "poor" nations were drawn -- face new demands for climate action. But observers say the domestic pressure to resist measures that could threaten the country's prosperity is equally strong. "Like every country, Singapore is interested in protecting its national interests while advancing the global efforts. So they have ... favored approaches that can achieve that," said Elliot Diringer, executive vice president of the Washington, D.C.-based nonprofit Center for Climate and Energy Solutions (C2ES). Singapore has long straddled the line between developed and developing nations in the U.N. talks. That's why, Diringer said, the government was an early supporter of a flexible Paris deal that might avoid those strict divisions. That appears to be how the agreement is taking shape, with countries defining their own plans for carbon cuts based on "national capabilities" instead of old categories. "I think that its position is shaped by resource constraints, as well as its economic position regionally. It is a very vibrant economy but has many rising competitors in the region," Diringer said. "Competitiveness is an issue for all the countries. I think Singapore would like to maintain a level playing ground so that it is not put at a competitive disadvantage." Experts outside and in Singapore say concerns over economic development, allied with resource constraints, have prevented it from pursuing ambitious climate change mitigation. In 2009, ahead of key U.N. talks in Copenhagen, Denmark, the government vowed to reduce greenhouse gas emissions by 7 to 11 percent below business-as-usual levels by 2020. That is expected to generate a reduction of emissions up to 8.5 million tons over a decade, a result that critics say is far too small for such a wealthy country. Singapore, with a land size smaller than New York City and a population of more than 5 million people, has the third-highest per capita economic output in the world. Recently, the government has pledged to push further. But the target submitted as part of a pending U.N. deal in Paris in December -- to reduce emissions 36 percent per unit of economic output by 2030 compared with 2005 levels as well as peak emissions around 2030 -- has not stemmed the criticism. Climate Action Tracker, an independent scientific analysis produced by four European research organizations to assess countries' pledges, described Singapore's as insufficient and warned they aren't even plausible under the country's current policies. "We rate this target 'Inadequate,' meaning it is not in line with any interpretations of a 'fair' approach to hold warming below 2ºC," the research group explained in a statement. 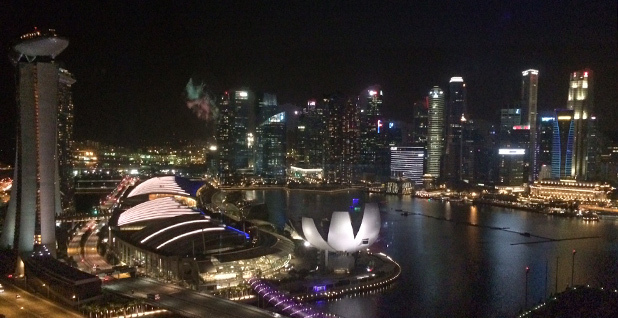 "If most other countries followed Singapore's approach, global warming would exceed 3-4ºC." Yet others say Singapore is probably not in the best position to be a climate change fighter. The country's flat landscape makes it difficult to produce hydroelectricity. Sheltered by Malaysia and Indonesia, there is little potential for Singapore to tap into wind power. Nuclear energy is not an option, either, due to its limited spaces. As an official jokingly put it: "If we have to evacuate, the whole Singapore probably will have to go to somewhere else." To clean up its power sector, Singapore has switched from burning oil for electricity to burning natural gas, the cleanest form of fossil fuels. Currently, natural gas makes up more than 90 percent of the country's power generation. Beyond that, Singapore has been taking preliminary steps to improve energy efficiency. The government here has established a multimillion-dollar fund to help factories replace outdated equipment with energy-efficient ones. Subsidized training course on energy management and grants for technology innovation have also been made available. Other energy-saving efforts include introducing minimum energy performance standards to major household appliances such as refrigerators and clothes dryers. By 2030, according to the government's plan, four out of five buildings in Singapore will have a BCA Green Mark, a local green building certification in which a building's energy efficiency is taken into account. Orchids, ferns and other types of vegetation grow along the road of Singapore and expand their territories to include walls. Visitors are reminded of rainforests while wandering around Southeast Asia's banking capital. At the same time, the green walls serve as natural "air conditioners" to keep the city-state cool. Officials say these measures have helped Singapore scale down its energy footprint. Yet government statistics also show the country's total electricity consumption more than tripled between 1990 and 2012. Singapore's Jurong Island, home to some of the world's largest oil refineries and the top source of the country's greenhouse gas emissions. Photo courtesy of Wikipedia. The similar trend also appears in Singapore's emissions profile. Although the country ranks among the top 20 percent most efficient in the world in terms of emissions intensity by the intergovernmental organization International Energy Agency, its total greenhouse gas emissions jumped by 74 percent from 1990 to 2012, according to the estimates of D.C.-based think tank World Resources Institute. A growing desire for modern comforts has also contributed to the increase. Like people around the globe, Singaporeans, who have worked hard for decades to lift the country out of poverty, now want to enjoy their fortune. The country's narrow streets are crowded with stalls selling the spiky, smelly durian fruit, as well as deluxe shopping malls. The real estate construction seems never-ending. It's not unusual to see a Lamborghini or Rolls-Royce drive by. On top of that, the country's dependence on the oil refining sector has worsened the problem. Oil refining has been the cornerstone of Singapore's success since its very early days. According to Ng Weng Hoong, a local reporter and author of "Singapore, the Energy Economy," the country's gross domestic product per capita was $1,360 in 1960 in Singaporean dollar terms. That level more than quadrupled in 1974, thanks to the operation of three oil refineries as well as skyrocketing oil prices in the 1970s. Ng noted that Singapore's maritime trade and port traffic also grew under the influence of the oil refineries. Meanwhile, the refining industry helped attract substantial investments for key supporting sectors such as banking, trading and engineering services. "In contrast, Singapore's electronics industry started off in the 1960s as a small TV assembly operation, while shipbuilding began as an experimental venture between Japanese and Singaporean interests. Neither these nor other industries could match oil refining in terms of investment size, value-add, export earnings or value of manufacturing output," Ng said. Fast-forwarding into the 21st century, oil refining and its downstream business still play a crucial role in Singapore's economy. In 2013, oil refineries -- together with petrochemical producers -- seized annual investment commitments of $1.8 billion, the second highest in the nation. The refining and chemical industries also contributed to around a third of Singapore's manufacturing output by value. 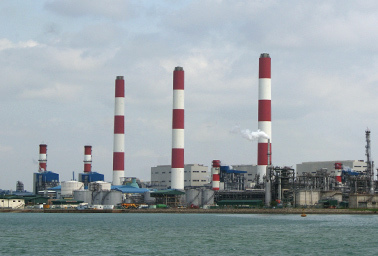 Although there is no official breakdown available in greenhouse gas emissions of each industrial sector in Singapore, the oil refining industry has long earned the reputation of being carbon-intensive. Fossil fuel combustion for powering heaters and boilers releases large amounts of carbon dioxide emissions into the atmosphere, as does the production process of oil refining. Methane emissions from a typical petroleum refinery arise from process equipment leaks and crude oil storage tanks. Flaring off waste gas also contributes to the overall greenhouse gas emissions at the refinery. In the eyes of climate activists, that has become a major obstacle in the country's journey to cut emissions. "To get the country to totally go out of it [oil refining], the first question every government should address is whether the country has any other alternative. Which Singapore doesn't," said Wilson Ang, president of the Environmental Challenge Organization in Singapore. "Nonetheless, since Copenhagen [climate change summit], Singapore has available funds in to encourage clean-tech startups and attract such companies to come to Singapore. However, it has not grown massively enough yet," he added. There is also an issue of fairness. Because most of Singapore's petroleum products are not consumed domestically, greenhouse gas emissions generated by the oil refining industry should not be simply counted as Singapore's responsibilities, said Edwin Khew, chairman of the Sustainable Energy Association of Singapore. Khew and others say Singapore's highly efficient oil refining industry could help the world meet its demand for petroleum at a lower environmental cost than elsewhere. Government officials also argue that even if Singapore stops building oil refineries, it would not make a big difference in combating global warming because the country accounts for only 0.11 percent of global emissions. "The point is that if you aggregate every country's contribution, it spells a difference," said Zelda Soriano, political adviser at Greenpeace Southeast Asia in the Philippines. 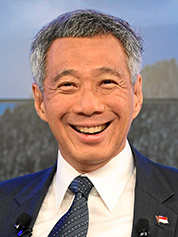 Singapore's Prime Minister Lee Hsien Loong has promised new efficiency measures for refineries but said the government "stands fully behind" the high-emitting sector. Photo courtesy of Wikipedia. "If you just take the possible contribution of Singapore, as a small island state, you will realize that it is such a small contribution to reduce emissions in general," Soriano said. "But every possible effort, every feasible level form of contribution from whatever source -- small, medium, big countries -- we would need all of them because what really matters is to aggregate all these efforts." 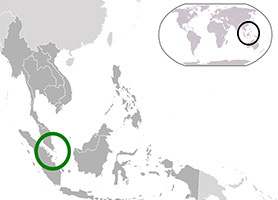 Moreover, as Singapore has long been viewed as a development model by many Asian nations, its policy has a strong influence in the region, and climate policy is not an exception, said Bernise Ang, a co-founder of nonprofit organization Syinc in Singapore. "If we are progressive, others will be encouraged," Ang said. "But the stakes are actually higher in the negative. If Singapore adopts less progressive policies at further cost to our environment, it becomes complicit to forming the kind of norms that give permissions to other countries in the region to do the same." While no country in history has achieved its economic growth without causing environmental damage, expectations for Singapore's mitigation ambition are particularly high because it is a leading figure in facilitating a global climate change treaty. With its unique position as a developing country under the United Nations and as one of the more advanced economies in the world, climate activists say, Singapore in recent years has become a bridge between the developing and developed world in the international negotiations. "I assume they have a much bigger say than they would claim," said a former negotiator who attended the U.N. climate change conference last year in Lima, Peru, and who spoke on the condition of anonymity in order to talk freely without seeking higher approval. "I think they have the greatest capability of any diplomats in small island states. They have the capability to try to play a role that is at the best to their national interest. The question is, what is their national interest?" the negotiator said. Can a country planning 80 coal-fired power plants get serious about climate change?